If you’ve read “Solitude”, you probably already know that “Crazy” is a pivotal character in the story, and even if you haven’t read the book yet, I think I can say without [spoiler alert] that her unusual name develops a tinge of irony as she becomes one of the sanest creatures in the novel’s universe. Due to my fondness for the canine character, I’ve repeatedly posted adoption notices for Chi and Chi-mix dogs on my (personal) Facebook page with pleas on behalf of Crazy that someone adopt one of these yappy little rat dogs. 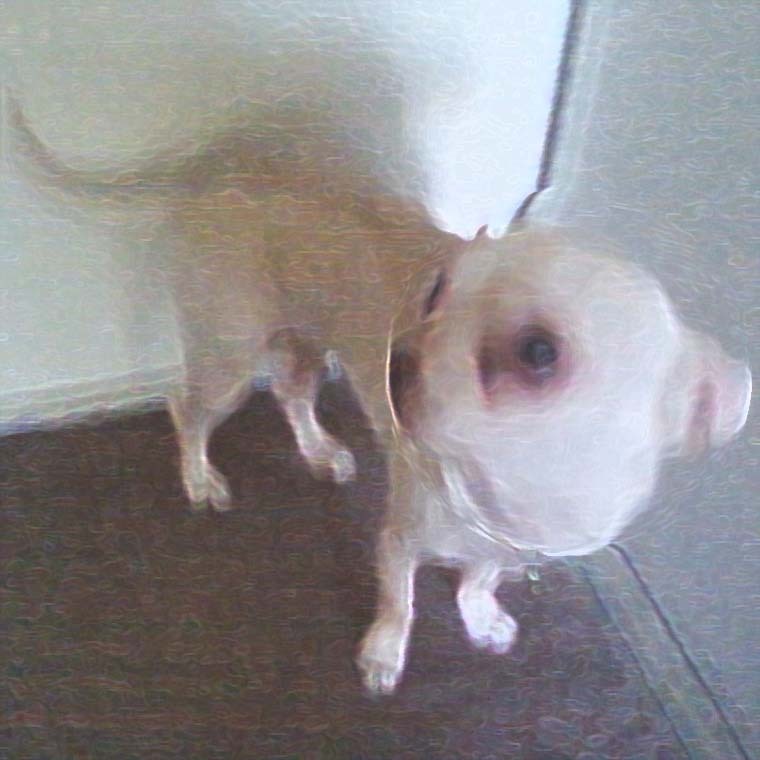 Spookified photo of my brother’s girlfriend’s chi-dog. I also have a small group on Facebook called “Team Crazy” where I discuss “Solitude” and it’s upcoming sequel, “Solitude: Disillusionment” (slated for an early 2013 release). I can tell you now that one character you can expect to see again in some form or another is Crazy: in the first book, it’s never really clear whether or not the Crazy we see is really Josette’s dog, or some kind of familiar. In “Solitude: Disillusionment” we’ll be going a little further down that rabbit hole. CONTEST RULES: Anyone can apply to this contest. Contestants will provide an image of the Chihuahua, Crazy – this can be a drawing, a painting, a computer generated three dimensional image, a photo of your roommate’s chihuahua, a photo of your cat in a chi-dog costume: hey, whatever you like. 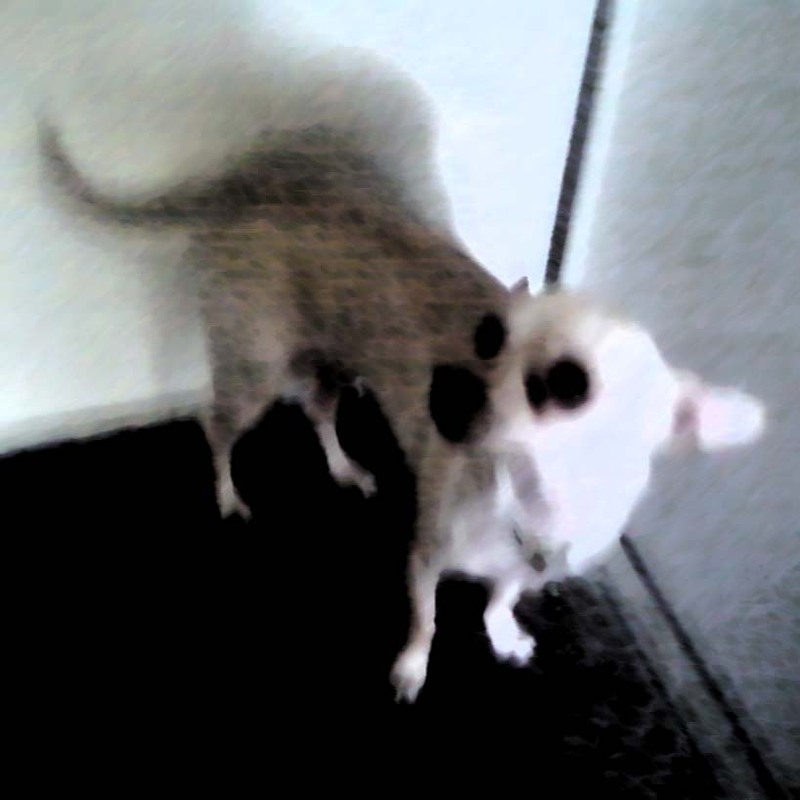 Ghost chihuahuas, zombie chi-dogs, rats dressed up as chi-dogs, use your imagination. But the submission deadline is August 1st, 2012. On August 1st, we will have people vote on these pictures by “liking” them. The person with the most “likes” wins an autographed copy of “Solitude”. I’ll repost it as an official submission so people can vote on it. NOTE TO CHI-RESCUES: I’ll be happy to post your chi-dogs in July, also. ~ by Sumiko Saulson on July 3, 2012.